We do not dictate to You that what is the best wall construction. Your opinion bases your need and that is the correct opinion. 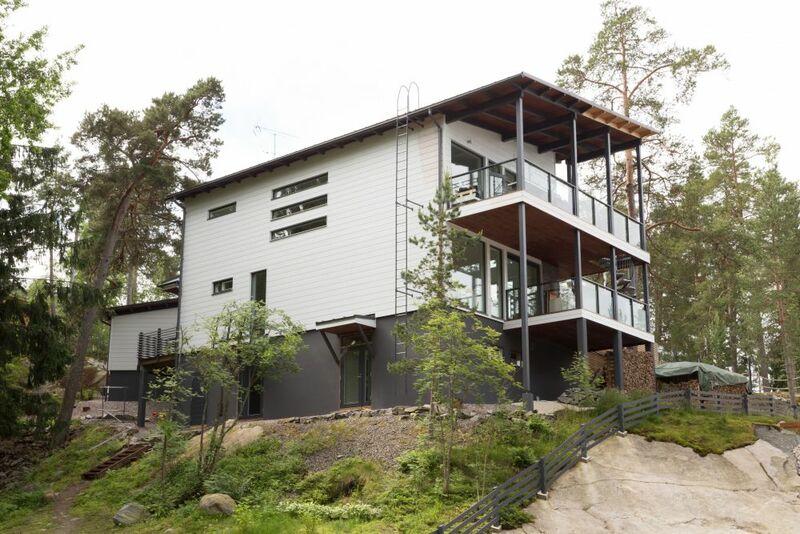 Eco Wooden Houses bases on wood and wood based materials. 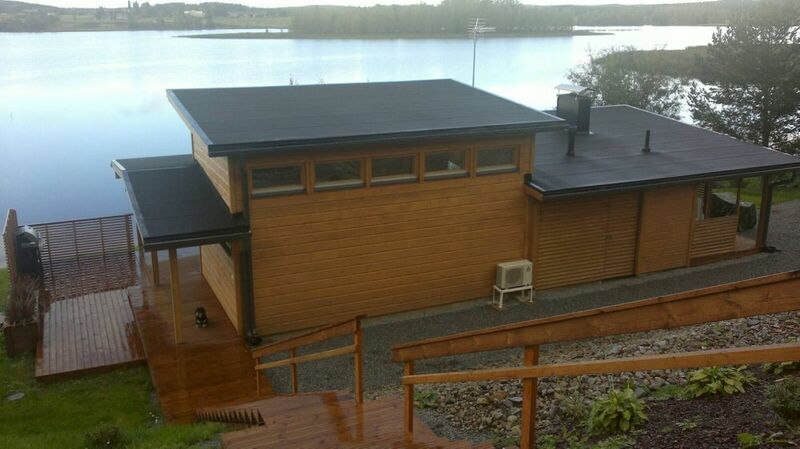 Wood panel cladded element has wood fibre plate as a wind break, the insulation is Eco-Wool wood fibre insulation plates and moisture barrier is carton. This technology gives warm and breathable construction. 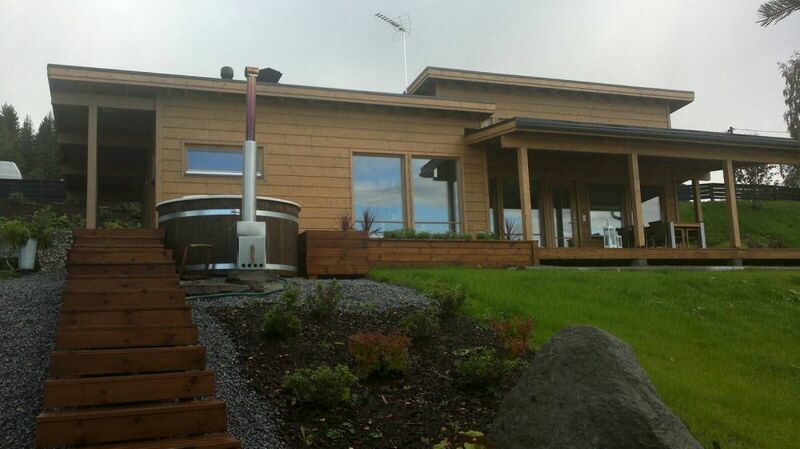 Wood and wood fibre combines and creates hygroscopic mass what can tie or extradite carbon dioxide and steamed water depending the atmosphere of room. 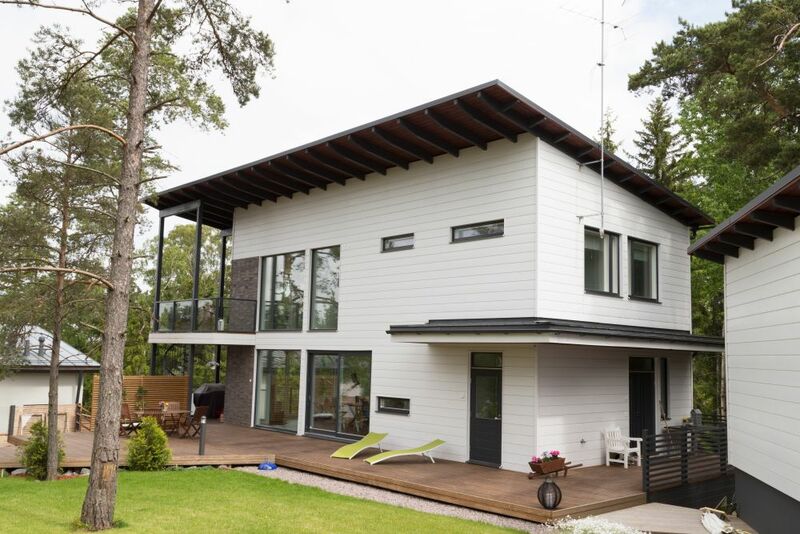 Ecology behind technology of Prefabricated Houses is energy efficiency. 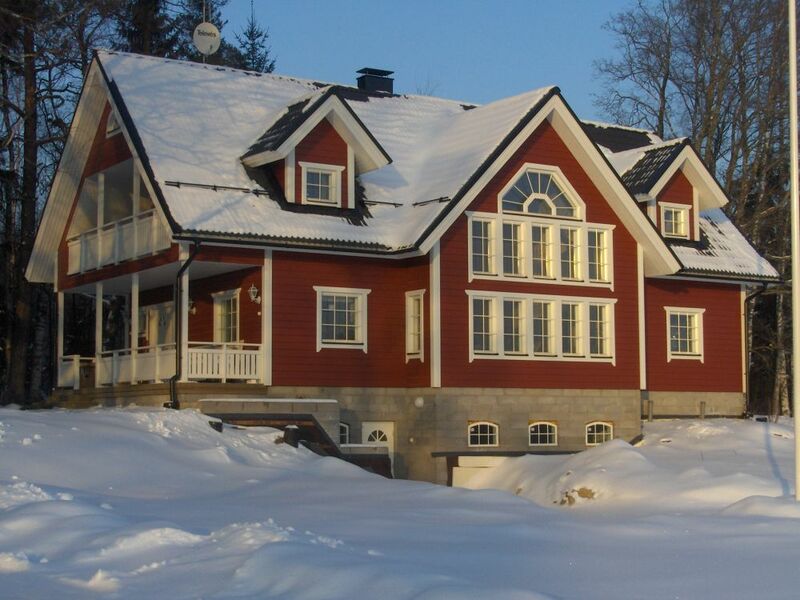 This can be reached by using the best insulation material in market and produce construction as tight as possible. This does not mean negative image “Bottle House”, but more positively “Thermos Bottle House”. Past decades construction mistakes caused a dark shadow over plastic moisture barrier and mineral wool. It was believed that these were the reasons for moisture, mold and other problems. This was not true, the reason was usually in foundation works (wet soil without drain, too low plinth, etc.) and roofing and ventilation mistakes. Today this shadow is cleared by known research institute as Finnish VTT. 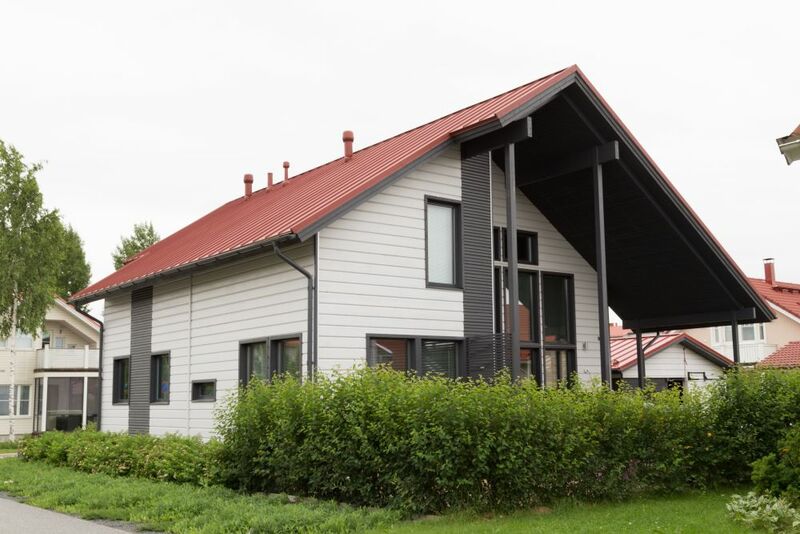 It is proven to be true that the tightness of construction is good way to build healthy buildings. 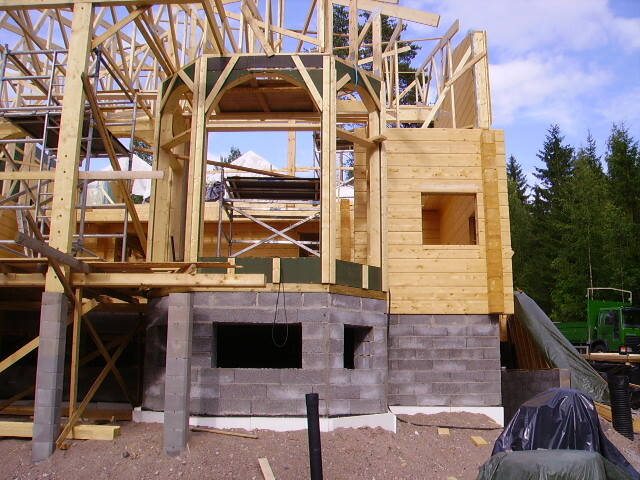 This technology is reliable and most common in timber frame buildings. And one of positive features of this construction is to be affordable. 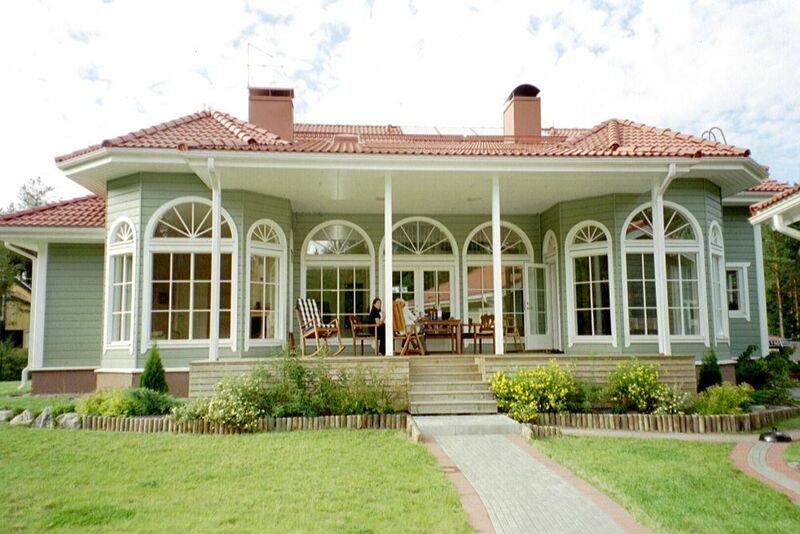 We produce timber frame elements also for log buildings to supplement pediments, dormers, oriels etc. 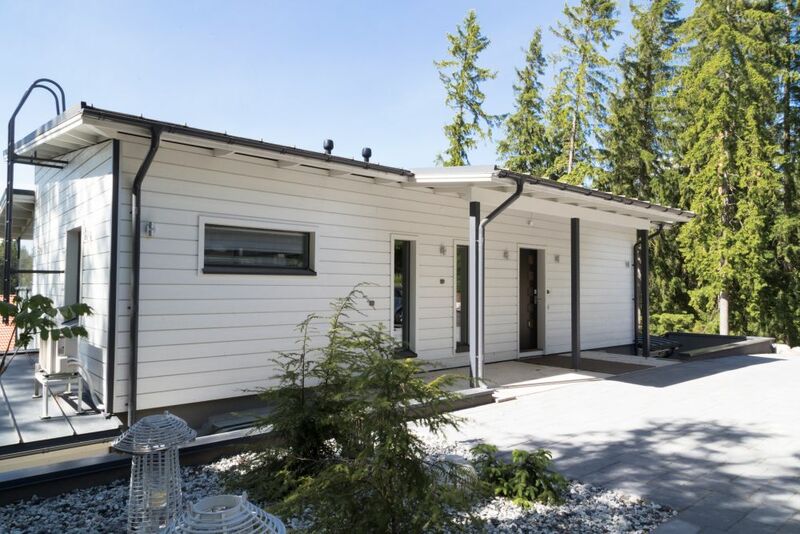 In this example photo are prefabricated pediment units on top of ground floor logs (also interior cladding installed) and the units of oriels are factory insulated, prefabricated frames. This gives even weeks benefit to builders timetable to reach roofing of house ready, compared to that all these frames and beams need to measure and cut and shape in building place. 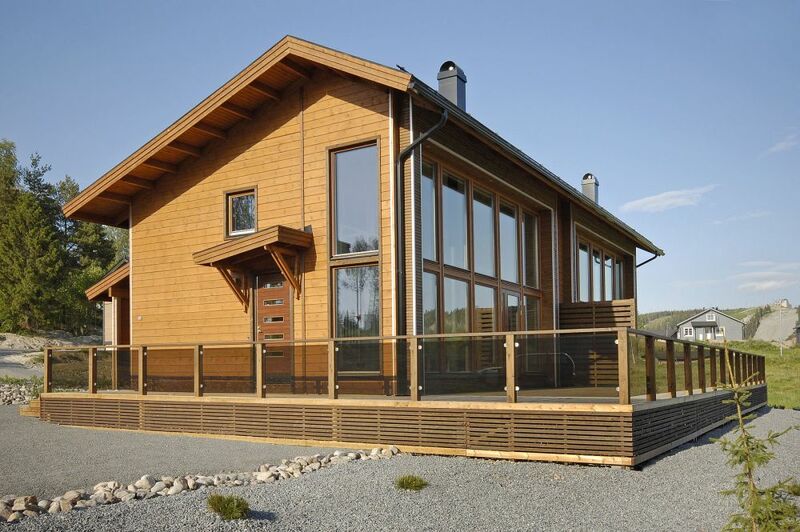 As prefabricated houses and log houses we produce is common factor the high degree of readiness. 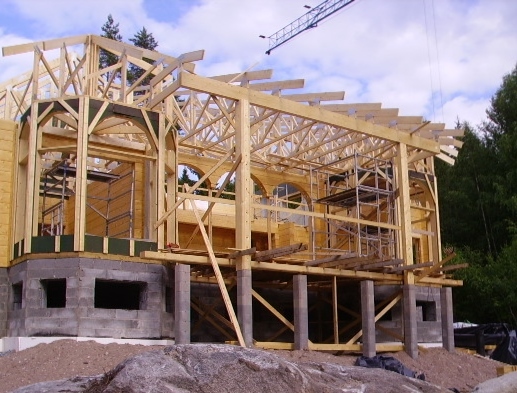 Among nail plate truss structures all bearing beams and columns for roof and intermediate floor structures are cut to size and ready for installation. Joints are mainly so-called pin and tail joints without no exposed nailing / perforated steel plates. 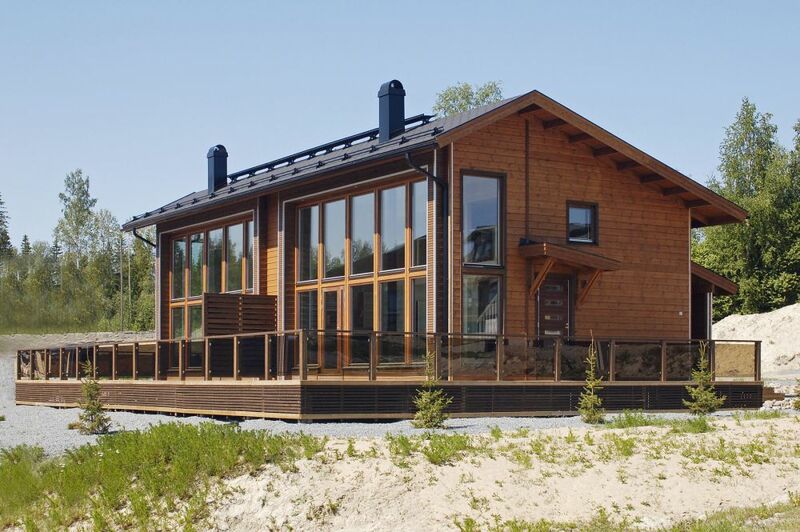 These prefabricated units we can produce as ready as needed. 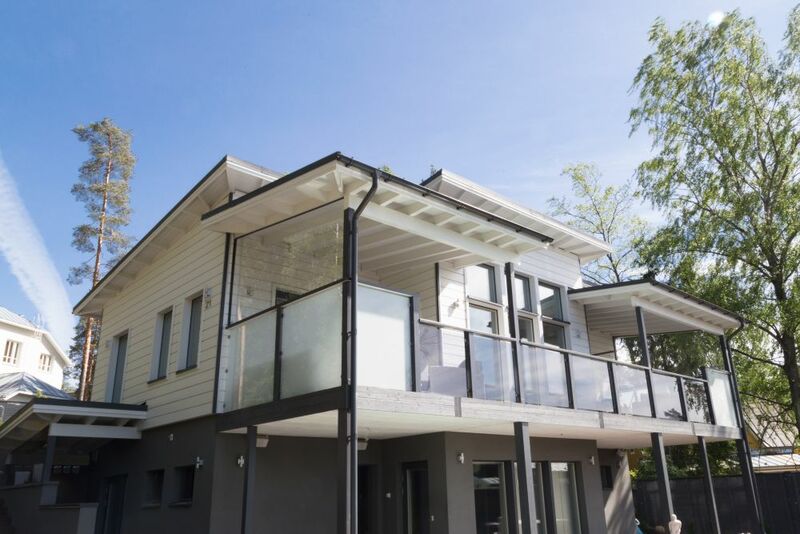 The highest level is ready starting from painted external cladding, ending to lacquered internal cladding, including windows, electrical pipes and boxes, external window boards and water bench. The final degree of readiness depends from clients need and will be settled to contract according to that. 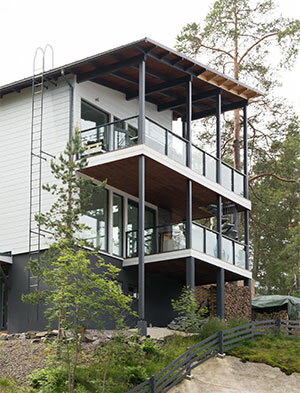 Pre-cut is an option, for example, if the building place is on the the island, where it is not possible to use the crane what elements installation requires. 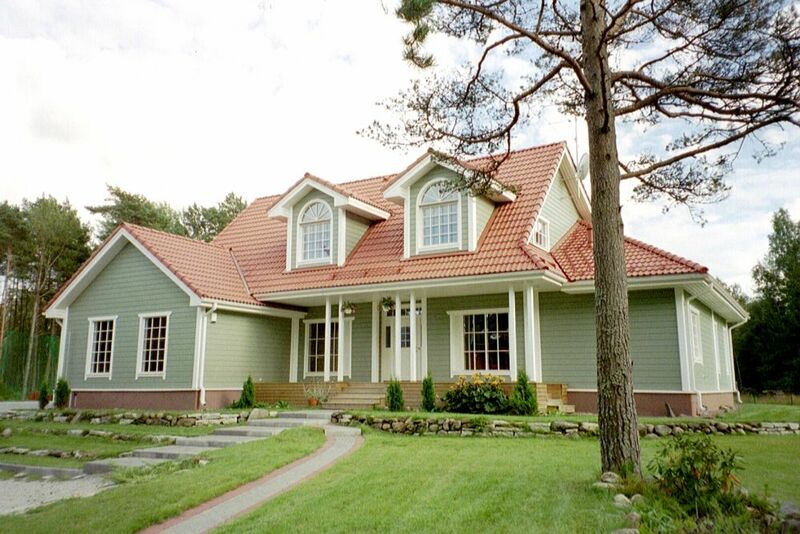 Profile: Log panel, round log panel, cladding board UTV, UTW etc. 95, 120, 145, 173, 198, 243, 271, 296, 344 etc.